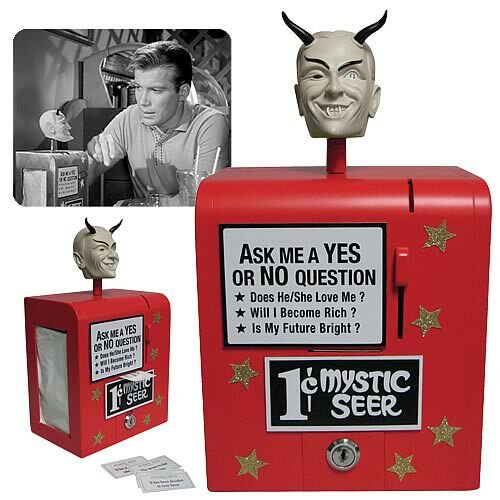 @BifBangPow: Pre-Order the Mystic Seer Prop Replica! 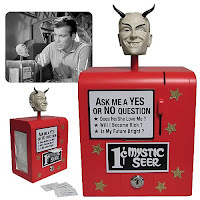 This incredible, super-deluxe reproduction is an authentic, functioning replica of the Mystic Seer featured in the legendary The Twilight Zone episode "Nick of Time" that starred William Shatner. Complete with napkin holder and menu holder-- just like in the show-- it features a working coin mechanism and can act as a bank. It even dispenses "fortunes"! Meticulously crafted of polystone and steel, the life-size Mystic Seer Replica is a colorful replication that measures about 13 1/2-inches tall x 7 1/2-inches wide x 6-inches long and comes with a certificate of authenticity. Can't you just see this in your living room or office? Not for commercial use.